A reported aerial bombardment (at 2200hrs local time) near an ISIL HQ east of Mosul, allegedly left up to seven members of the same family dead and injured in the al-Wadha Street area. At least three women were reported killed and a man and child injured. While Baghdad TV attributed the strike to US aircraft, other media referred only to unspecified aircraft, or said that Iraqi forces were responsible. According to local media, residents had earlier been warned of imminent airstrikes: “Iraqi planes dropped leaflets two days ago, in which civilians were warned against mixing with members of IS to avoid harm from any Iraqi security strikes targeting the organisation.” In response, ISIL reportedly evacuated part of its HQ in the city. The incident occured at approximately 10:00 pm local time. 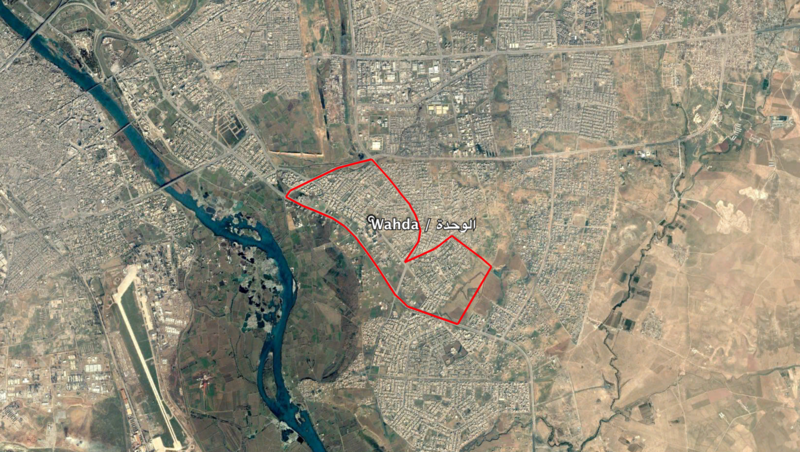 Reports of the incident mention the neighbourhood Al Wahda (الوحدة) in the east of the city of Mosul. The generic coordinates for this neighbourhood are: 36.3290942, 43.1870842.